Picture a young woman in acting class. Her days are spent creating people from a page of writing by an author she has never met. Somehow she has to breathe life into this character and feel their feelings and justify their actions. The 25 character Questions–are those the only ones? No. Will there be more? Always. Each character has their own backstory. The list has been culled from every part I ever played and every story I ever wrote. When I was in acting class I needed to know all the information in those 25 questions and more. I had to visualize those answers. I had to feel the pain, joy, sorrow and excitement that is rooted in those answers in order to fully embody the character. When you start high school, teachers begin to pick apart stories. More often than not, they focus on the facts of the story, the dates, names, and places. They also focus on the literary techniques foreshadowing, pathetic fallacy, etc. This is why some kids check out in English or History class. But once in awhile you get a teacher who breathes life into a story. You get Lin Manuel-Miranda who makes the entire world passionate about the first treasury secretary of the United States. What? Truly, he made the beginning of this country, down to the placement of the U.S. financial center and the capital exciting. How did he do this? He told the story of the people. We are involved instantly in his fate and we want to know. Now you have kids all over the world acing this part of the US AP exam because he brought Hamilton alive. We need to bring our characters alive. The way we do this is to tell their story honestly and deeply. We need to create characters who are flawed, who want something more than life…with something else standing in their way. We need to build characters to cheer for. Audiences pack the theaters to see how the story turns out. We all know how the story turns out: Hamilton dies. But does he? Make your enemies as strong as your heroes. Make their backstory dynamic and heartfelt. Remember many people have similar experiences, but react differently. We get involved in a story because we want to see how our hero survives it. You cannot make the backstory, the underlying drive of your characters is too strong. For every book there are actually several more…written in order to understand how each character got to the perfect place and time to meet and create history. Join me next week for my Character Challenge! 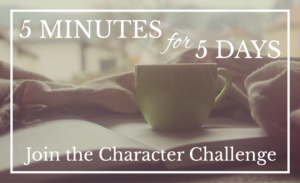 Starting Monday, May 15th, you can join me in making a commitment to 5-minute challenges for 5 days, all toward creating unforgettable characters! Plus, I will be hosting a special Live Character Q&A on Wednesday, May 17th at 6:00 PM Pacific on the Facebook page! Sign up for the challenge now – and I hope to see you on our live Q&A! P.S. If you don’t have my 25 questions yet – you’ll get them on Day 1 of the challenge!